instream TV features an easy to use web-based management interface that enables you to quickly upload new content and make changes from any internet enabled device. Create your playlist from over 140 dental, entertainment and clips – or add your own videos. Display up to 10 personalized messages and RSS feeds such as local or international news. 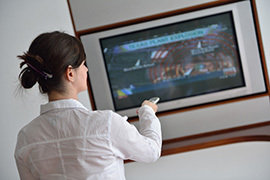 You have complete control over what treatments and content are shown on your Waiting Room TV monitor. Present what you want in any order. instream automatically provides new content every quarter. Video clips cover a broad range of treatments including gingivitis, cosmetic procedures, and porcelain crowns. Provides a cost effective marketing platform for communicating with your patients. Motivates patients to ask questions about services they may not realize you offer. A proven way to improve average revenue per patient. Creates a more involving and interesting experience for your patients. Educates patients about the importance of oral health and other dental issues. Add your own “before” and “after” segments to showcase dramatic successes and patient benefits – and personalize the presentation. Ensure all patients understand what you offer and what is unique about your practice. Help patients feel at ease with friendly welcome messages and greetings. Create levity with seasonal templates and fun quizzes that help quickly pass the time. Get faster understanding and acceptance of a recommended procedure. Include information on your team’s credentials to build patient confidence and trust. Help your patients quickly visualize a complex treatment. Ensure patients see up-to-date information on your practice, technologies and treatment options. Over 140 Video Clips in 2D & 3D. See List here. One time shipping fee for the instream TV player required. Shipping fees also apply in case of return due to defect or cancellation of subscription. Discounts offered when bundled with instream SHOWPLAN. Please contact us at (833) 788-7469 (833-7-TVSHOW) to require more information about our bundled solutions. Dr. Terrence Yacovitch B.Sc. D.D.S. instream SHOWPLAN takes in-chair consultations to the next level with fully interactive 3D treatment models. You or your patients can take control of 3D animations by rotating 360 degrees, zooming in or out, etc. Enables you to quickly present treatment plans – in about 30 seconds. instream TV is a cost effective visual communication solution for educating your patients, improving the waiting room experience and increasing your average revenue per patient. Schedule a FREE 30 minute live web demo. Use our scheduler by clicking on the button below to select the time and date that is most convenient. Email us your questions at info@instreamcanada.com and an instream consultant will reply within 48 hours. Register for an instream TV Subscription online today! Click here to Configure your Plan, Purchase Recommended Products or Additional Subscriptions and Purchase your instream TV Subscription.